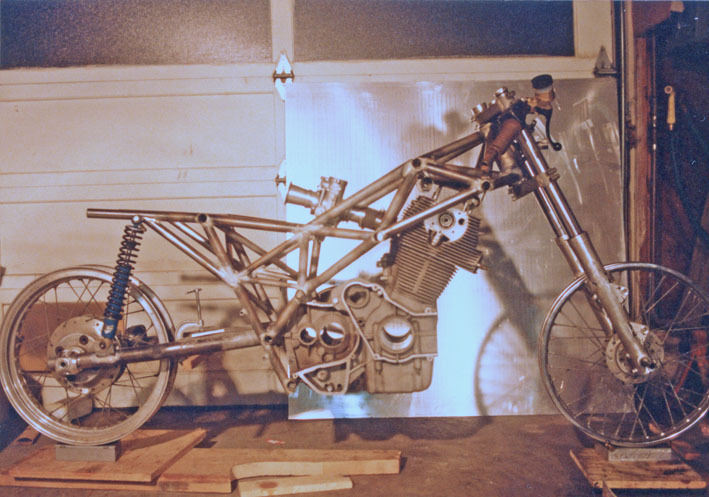 Here are two other pages with information relative to this bike. They've been in place for some time so I'll just leave them as separate pages. 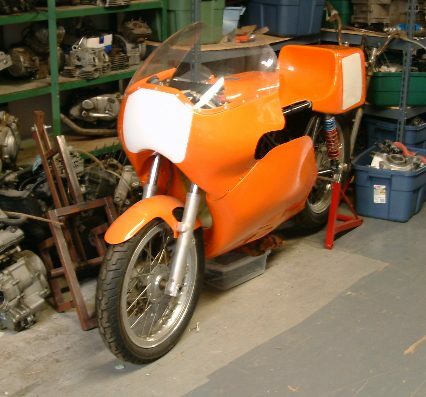 On this page I'll discuss the five versions of the Laverda racer and show photos from the construction process and some of the bike at the track. 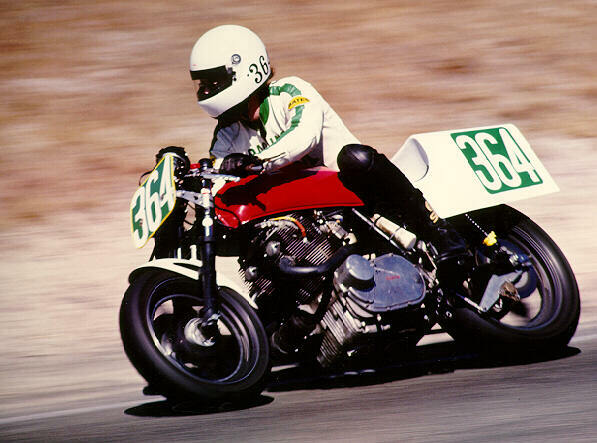 In the mid 1980s I swapped my Kenny Roberts' framed Yamaha TT500-engined singles racer for a Laverda SF2 750cc twin. 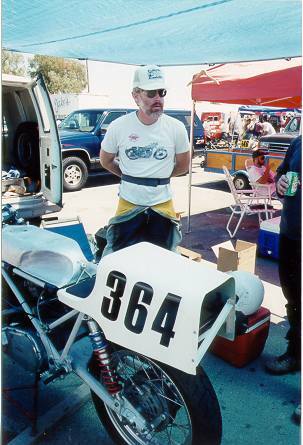 My intention was to go racing in the Battle of the Twins (BOTT) class, both in my local roadracing club the American Federation of Motorcyclists as well as with the AMA. 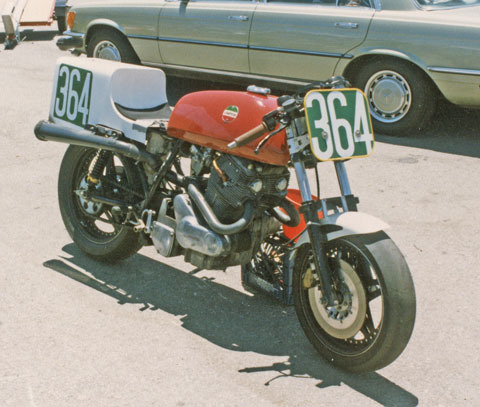 I never rode the Laverda on the street -- on getting it home I started stripping it down and modifying it for racing. 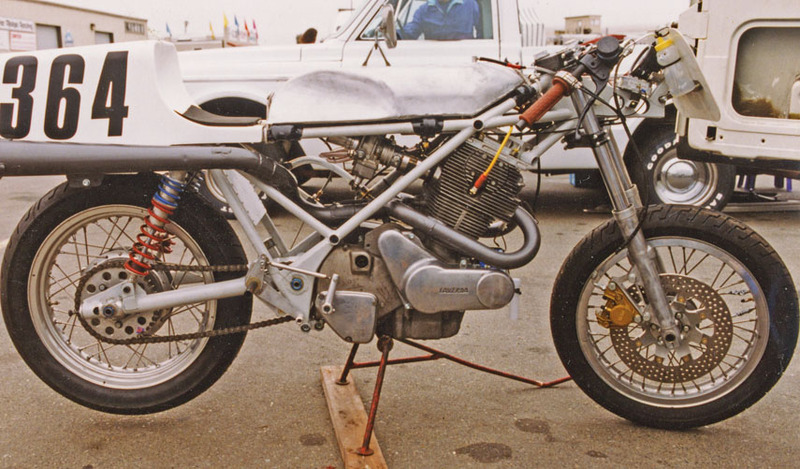 The Mark 1 version of the Laverda 750 SF2RR racer was using the standard chassis. I changed the wheels for a 3.5" x 16" Astralite front and 3.5" x 18" Astralite rear. 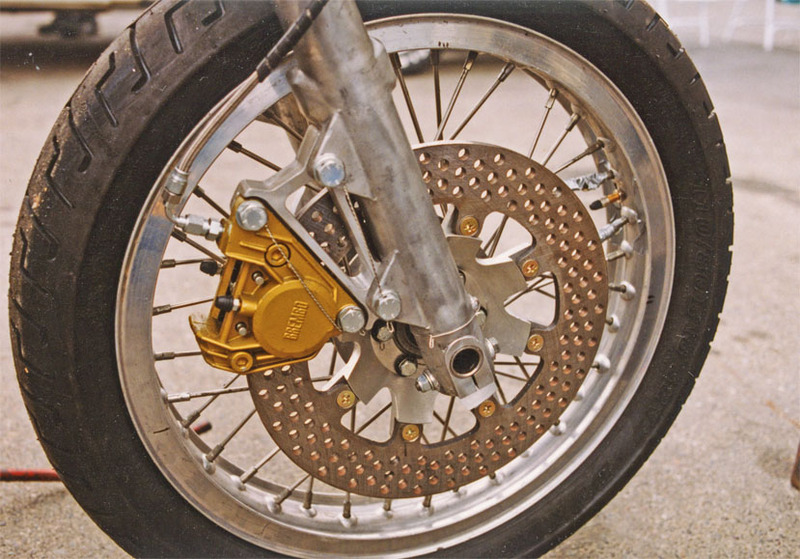 I used a Hunt ceramic-sprayed aluminum rotor on the rear wheel and a stainless steel/aluminum/stainless steel sandwich rotor from Erik Buell on the front. 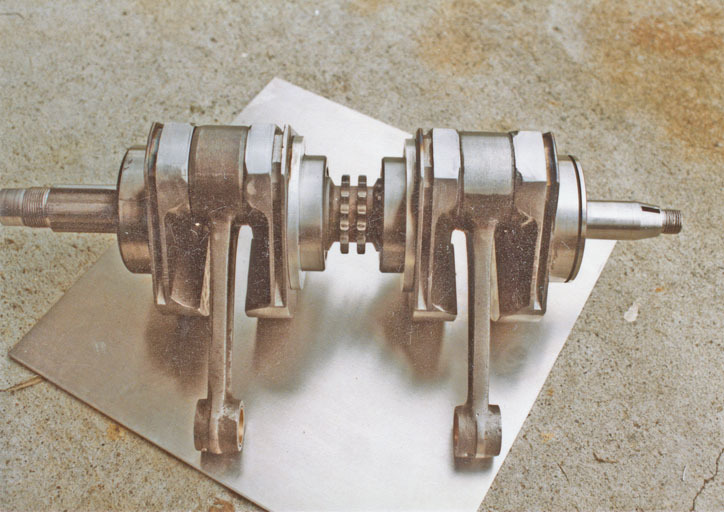 Those were grasped respectively by a four piston and two piston Brembo Gold Line caliper. 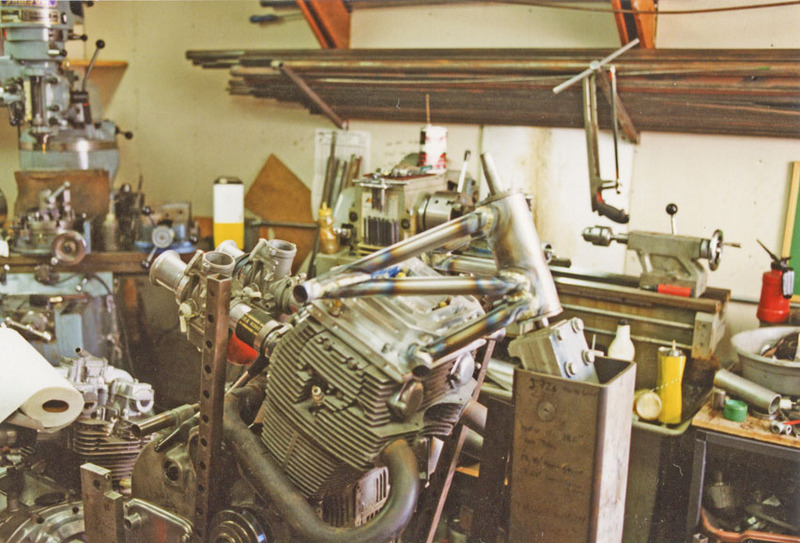 I installed SFC pistons, 5c cams, SFC valve springs, 38mm Dell'Orto carbs, some porting on the head and a 2-1 exhaust pipe. 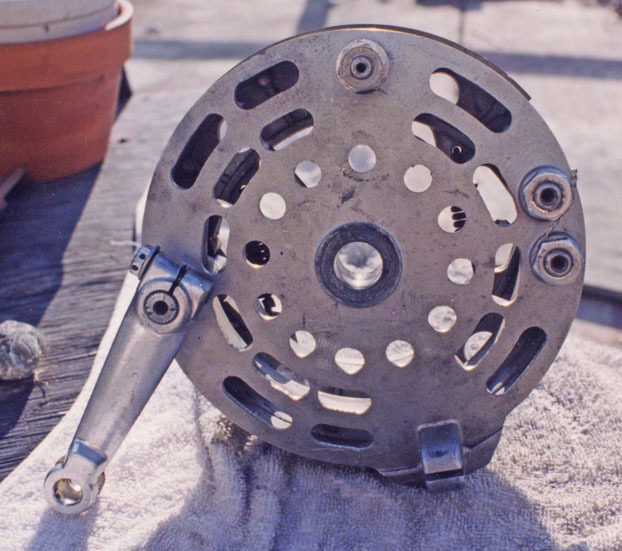 A Lucas Rita ignition was grafted on. SF2RR Mk1 Parts starting to come off the bike. 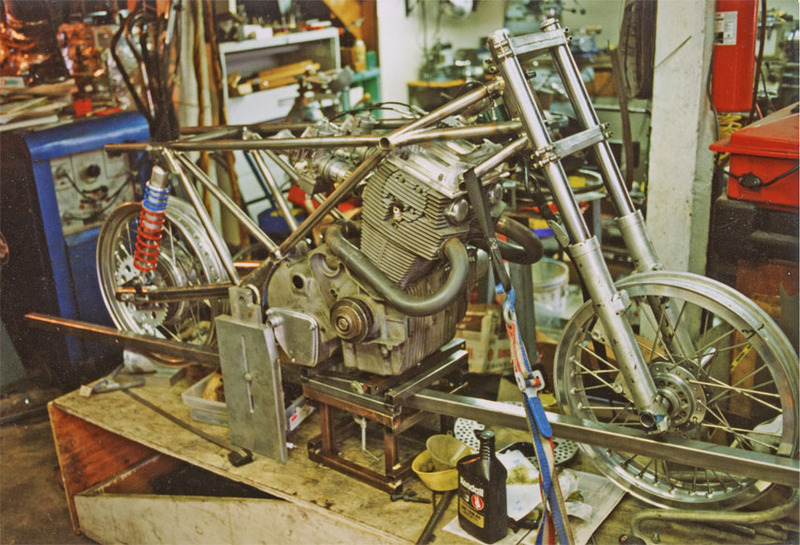 SF2RR Mk1 Up on the work stand starting to build the exhaust. Wheel and brake swap done. SF2RR Mk1 Right side view of the finished bike. 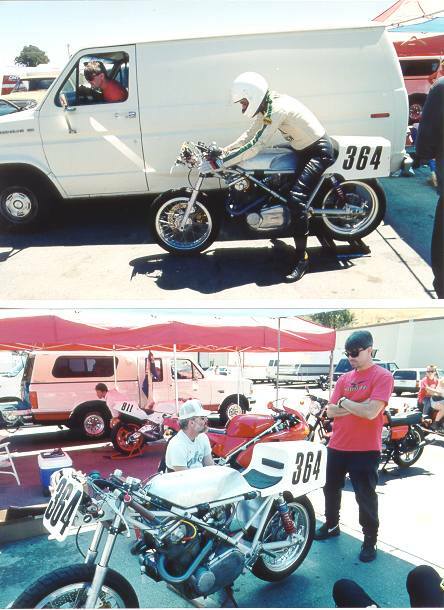 SF2RR Mk1 In the pits at Sears Point for the AMA BOTT race. 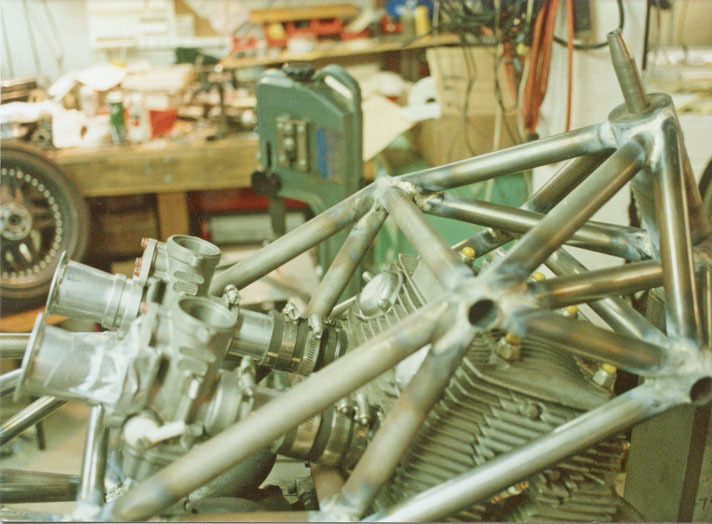 The Mark 2 version of the Laverda 750 SF2RR racer was started when I decided to try my hand at building a frame. This was going to use a Hossack-style FFE (funny front end). 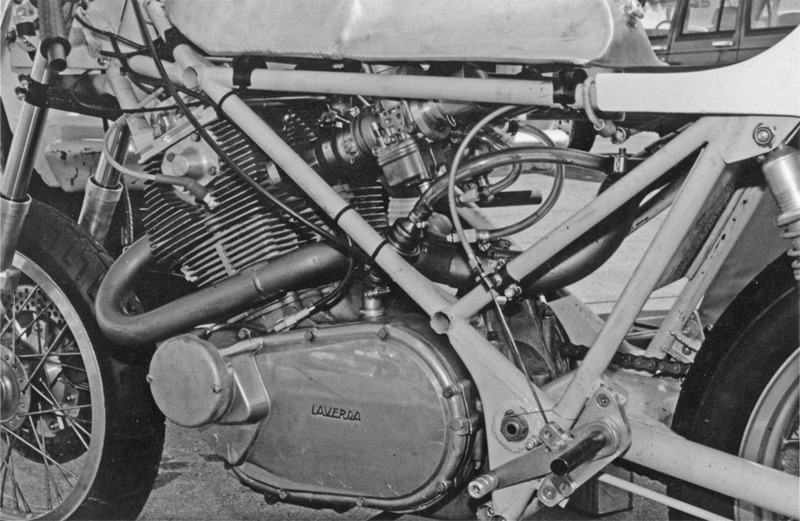 The a-arms would pivot near the ends of the two front cross tubes. 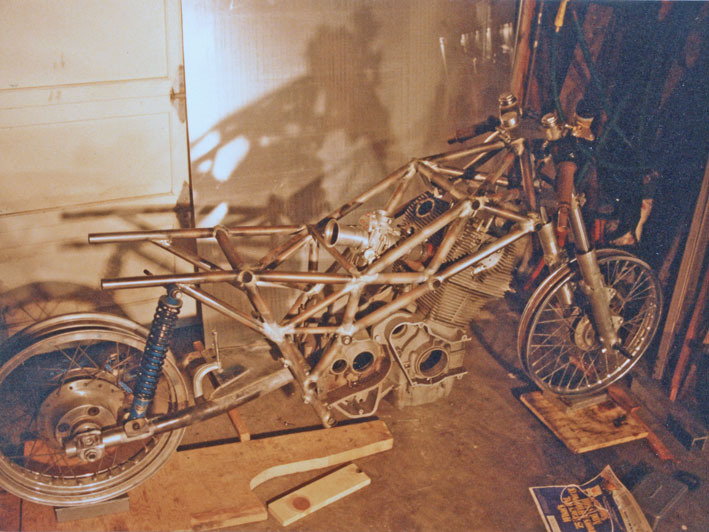 I never got past the main frame and swing arm. 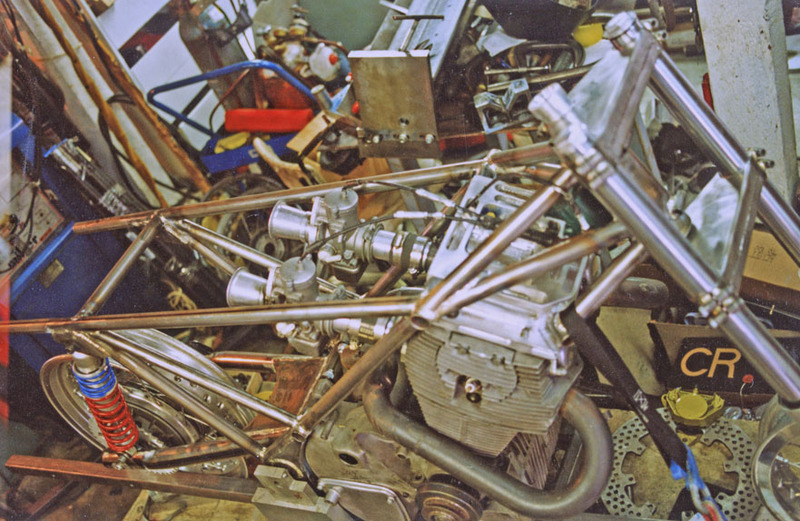 SF2RR Mk2 From the left rear. 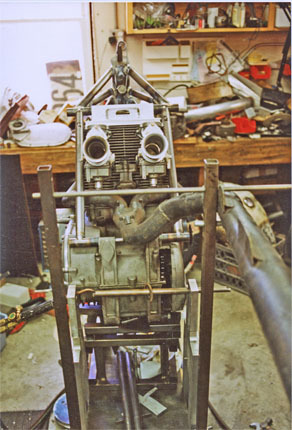 SF2RR Mk2 From the left front. SF2RR Mk3 The steering head and some stub tubes attached to the rocker cover. 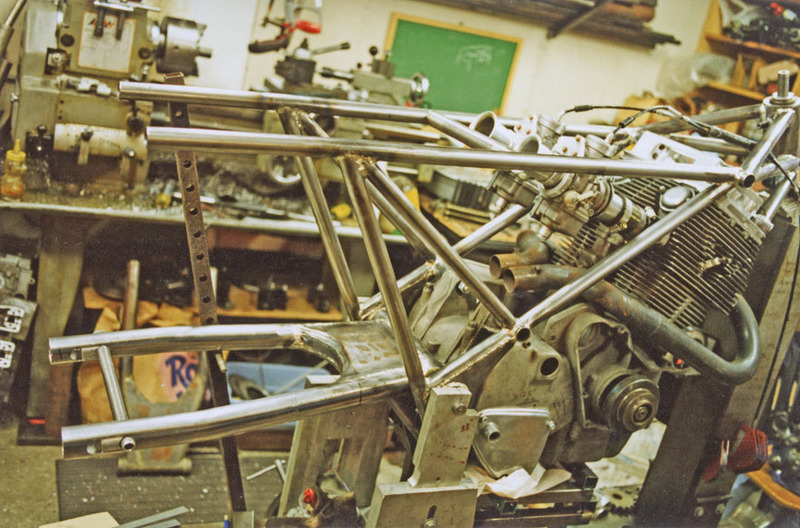 SF2RR Mk3 Back view of the engine on the frame fixture. 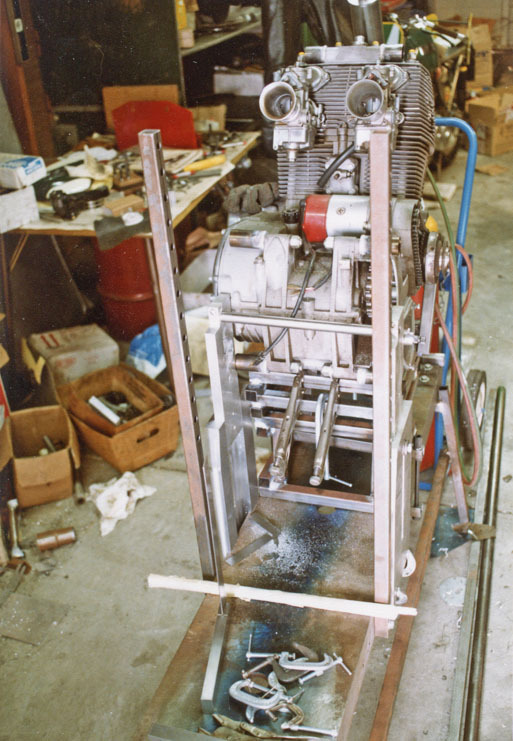 SF2RR Mk3 Right side view of the engine on the frame fixture. SF2RR Mk3 Right side of the steering head assembly. It looks like I was a little cold on the bead temperature. SF2RR Mk3 Another shot of the steering head assembly. 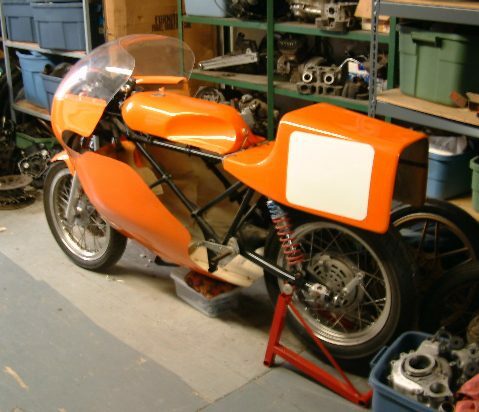 The Mark 4 version of the Laverda 750 SF2RR racer got to the point of being on wheels but no bodywork was done. 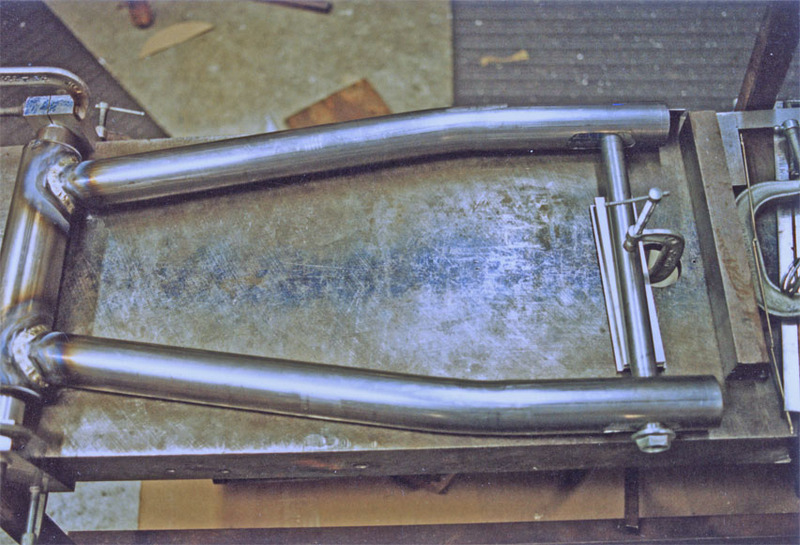 I recycled the rear portion of the chassis from the Mark 2/3 bike and attached new tubing to the front. 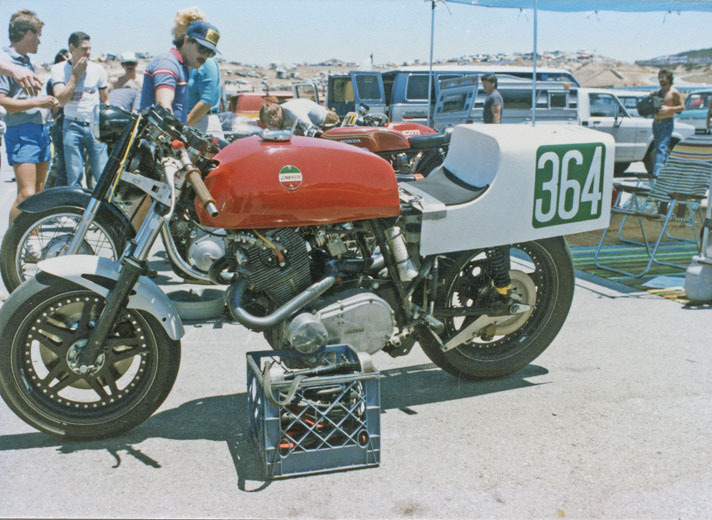 By the time I finished it was clear that for the special-framed class an open Twin was needed, and I'd decided that racing vintage instead of BOTT was more appealing (and more appropriate for my skill level). 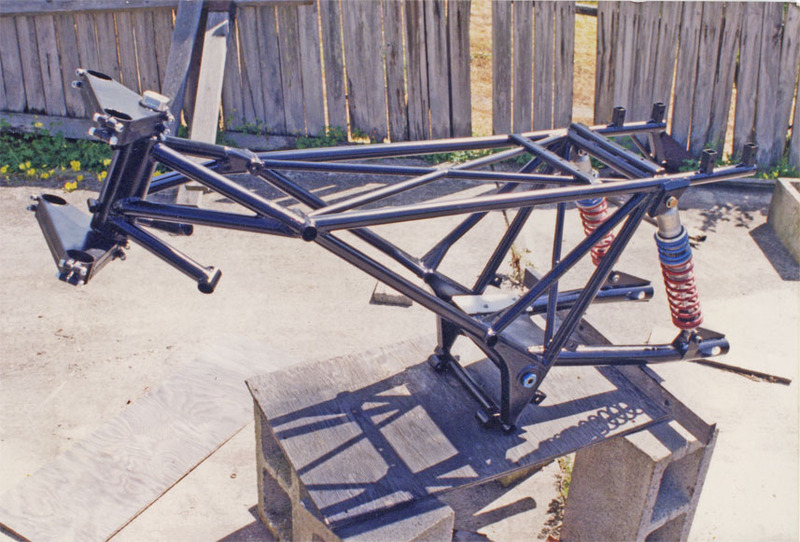 SF2RR Mk4 Frame mostly done, no damper mounts. Right side view. SF2RR Mk4 Left side view of above. SF2RR Mk4 A shot that shows more of the steering head bracing. SF2RR Mk4 As above but from a different angle. 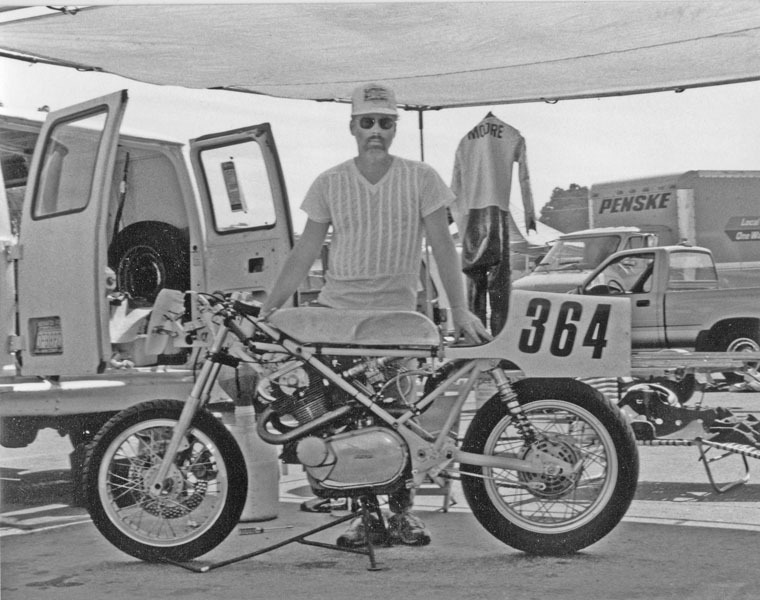 You can see the Honda CR216 in the background. 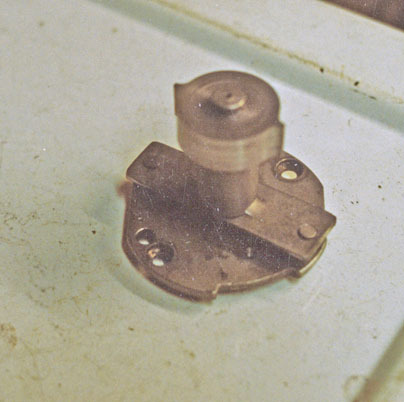 Note that the accelerator pumps have been removed and adapters made to centralize the velocity stacks on the bore of the 38mm Dell Ortos that are taken out to 40mm. 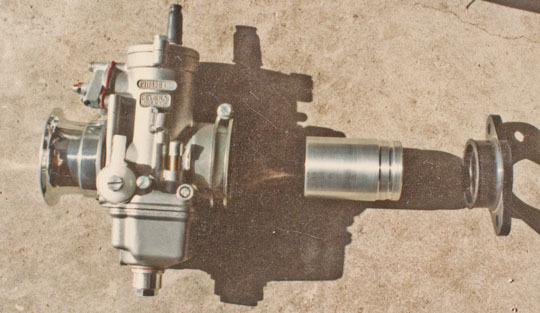 SF2RR Mk5 Another carburetor photo. SF2RR Mk5 The unmodified 38mm Dell'Orto with long adapter and rubber manifold. SF2RR Mk4 My messy garage! 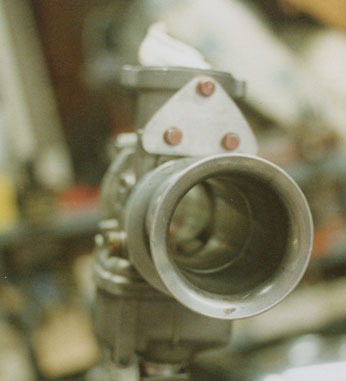 SF2RR Mk4 A photo showing the "smooth" bore of the carb. 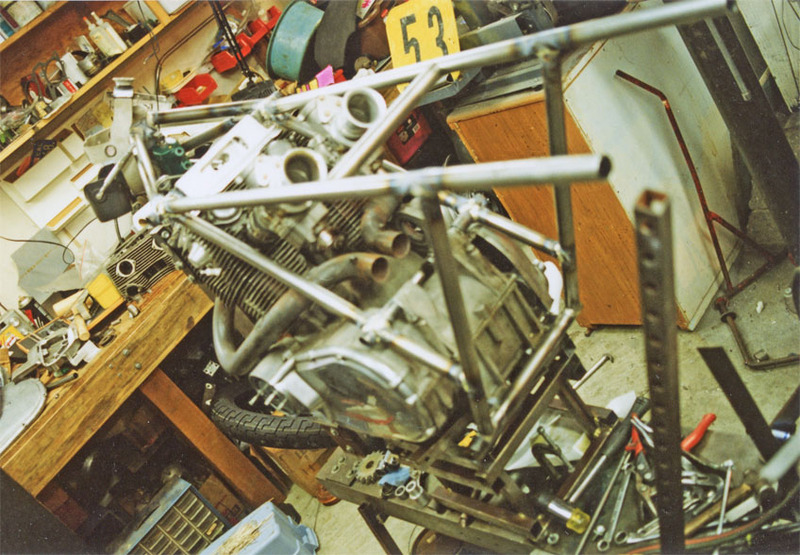 SF2RR Mk4 Frame (now with damper mounts) and engine on the workbench. 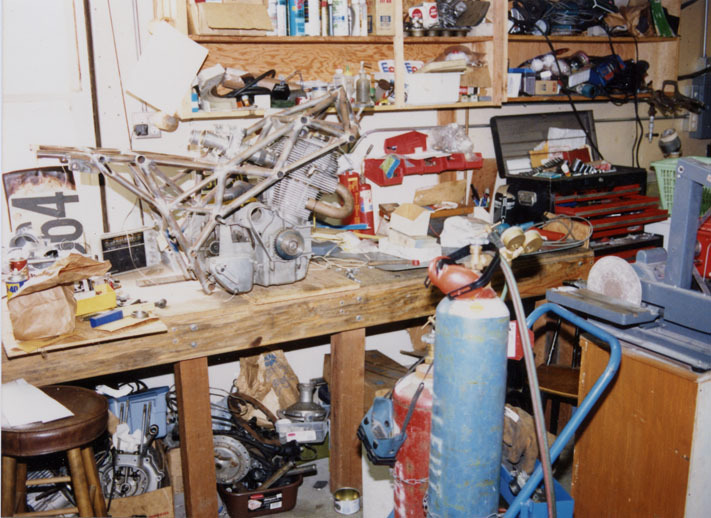 My Matchless G80CS engine is lurking under the workbench. SF2RR Mk4 A closer shot of above (a little blurry). SF2RR Mk4 Up on wheels - right side. SF2RR Mk4 Right side from the rear. SF2RR Mk4 Right side from the front. 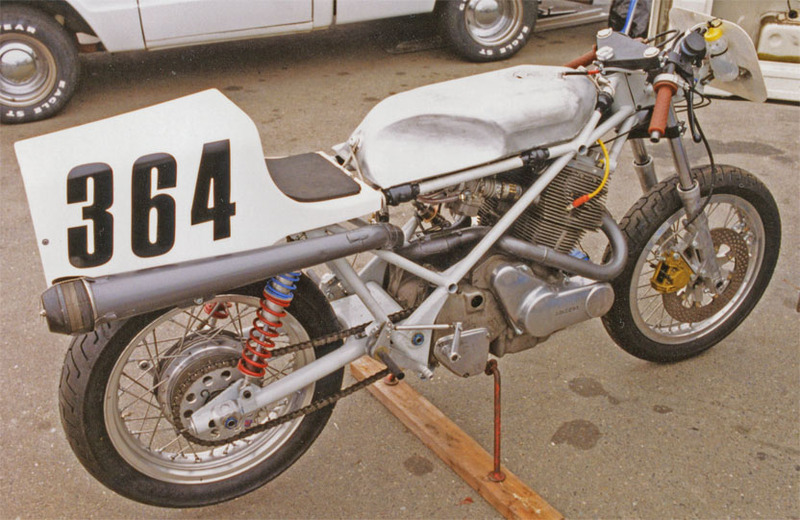 The Mark 5 version of the Laverda 750 SF2RR racer. 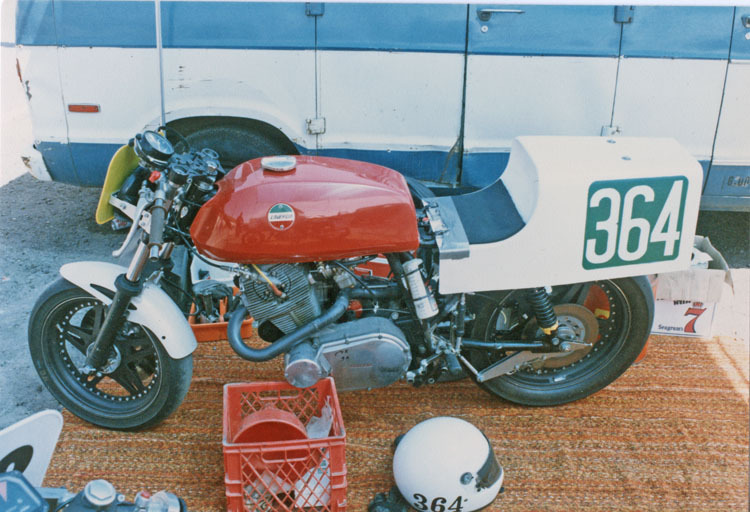 I had several races on this version and I was surprised at how it wasn't very fast. 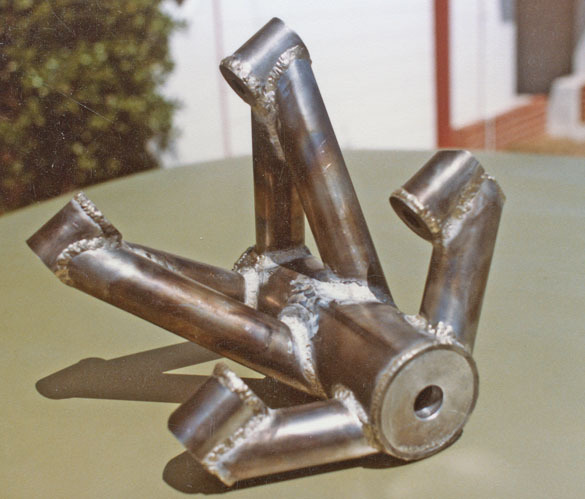 I eventually put it on a dyno and after some investigation determined that I'd been sent late-model SFC pistons that were very different on the deck height from the standard pistons, leading to a very low compression ratio. 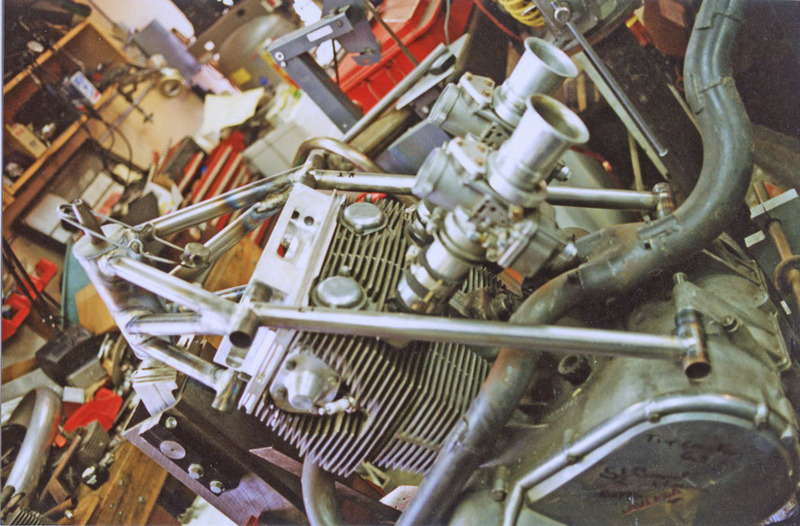 After shortening the cylinder and having a bit more porting work done the engine put out 74 bhp at the rear wheel on a water brake engine dyno. 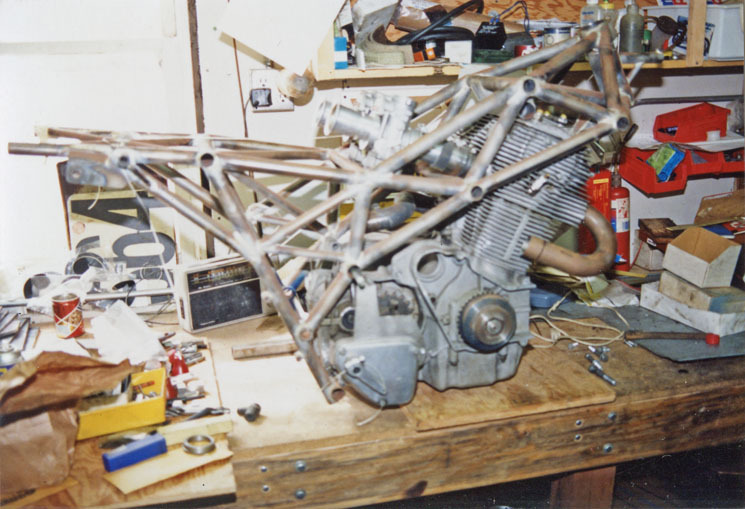 I ordered new JE pistons in stock height and did some work to space the cylinder up and set the squish bands, but never got the engine back together and in the bike before selling it to another Laverda enthusiast. 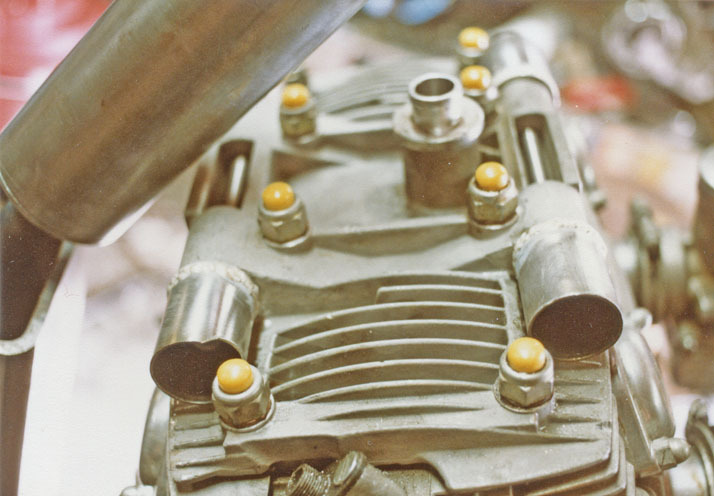 New cams were developed by Megacycle too, so I expect the final version would probably put out 78-80 bhp at the rear wheel. 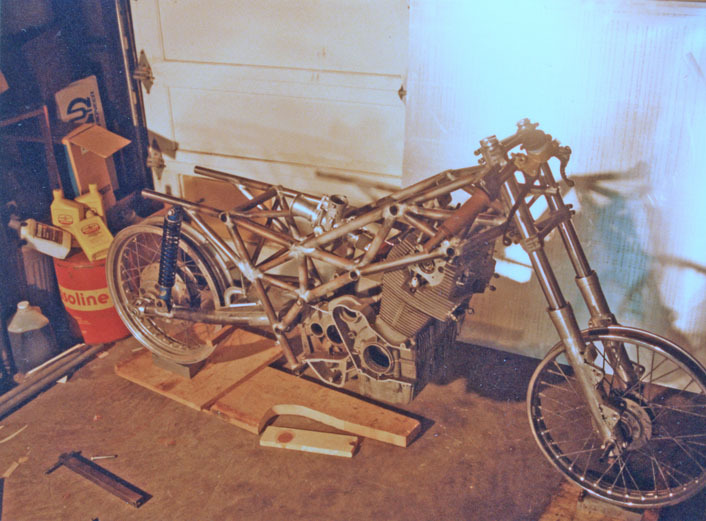 I modeled the frame along the lines of a MK3 Seeley. 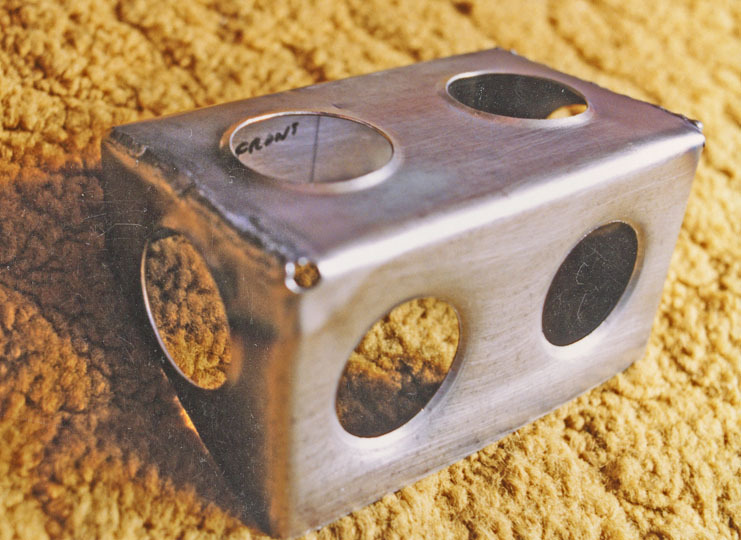 This time I decided to make a new rocker cover that would be sturdy enough for chassis use. I moved the mounts on the rocker cover to the outside corners. SF2RR Mk5 The back of the steering head and the rocker cover. 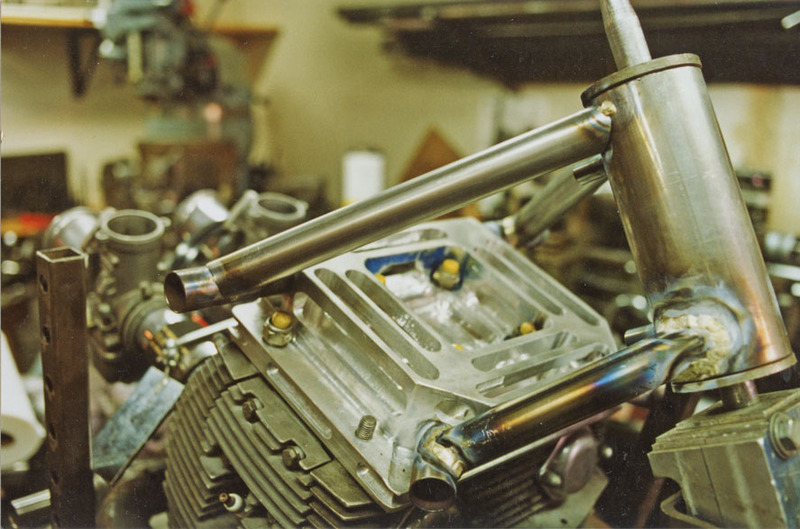 The small tubes are ignition coil mounts. SF2RR Mk5 Right front photo of the above. 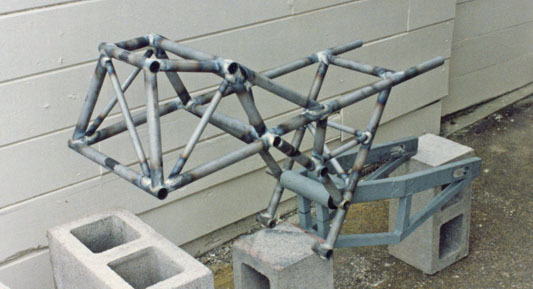 Note that the upper tubes are only tacked in place. SF2RR Mk5 As above but from the left side. SF2RR Mk5 As above but a little farther away. 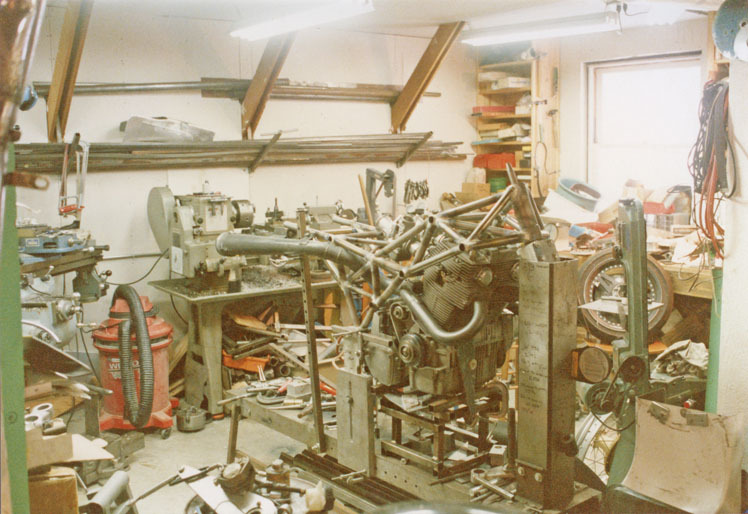 My milling machine and lathe appear in the background. 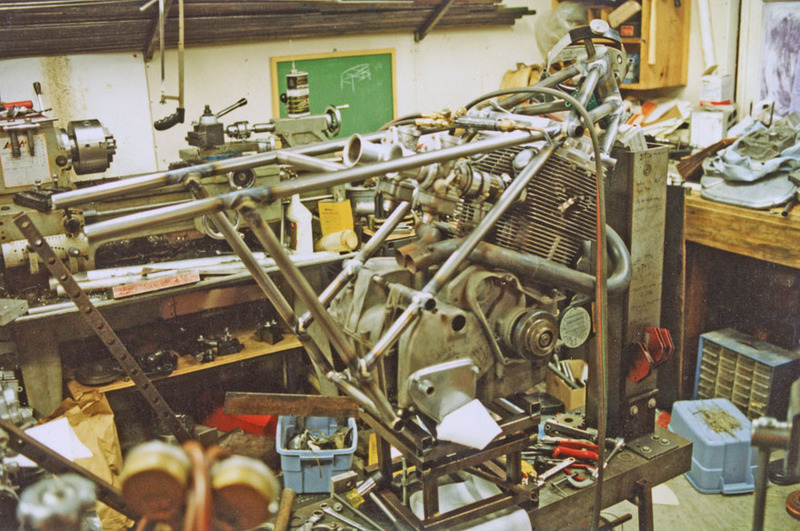 That is a 540cc Suzuki GS450 race engine on the floor to the left. SF2RR Mk5 From the rear. A couple more tubes have been added. SF2RR Mk5 As above from the left rear. 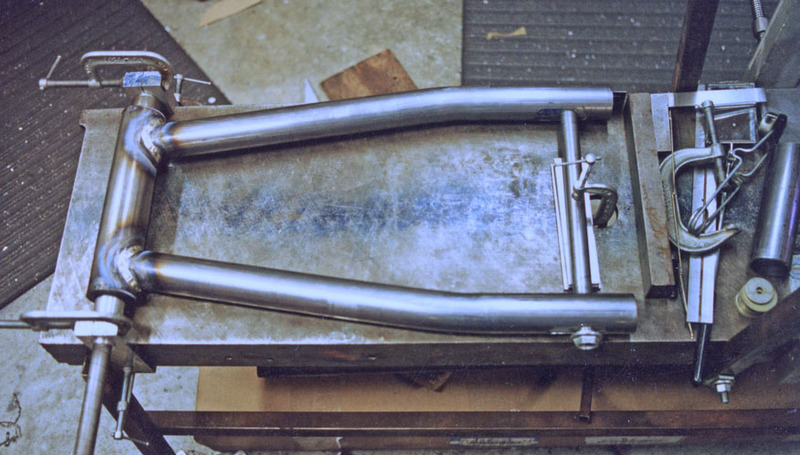 SF2RR Mk5 Right rear, more tubes added. 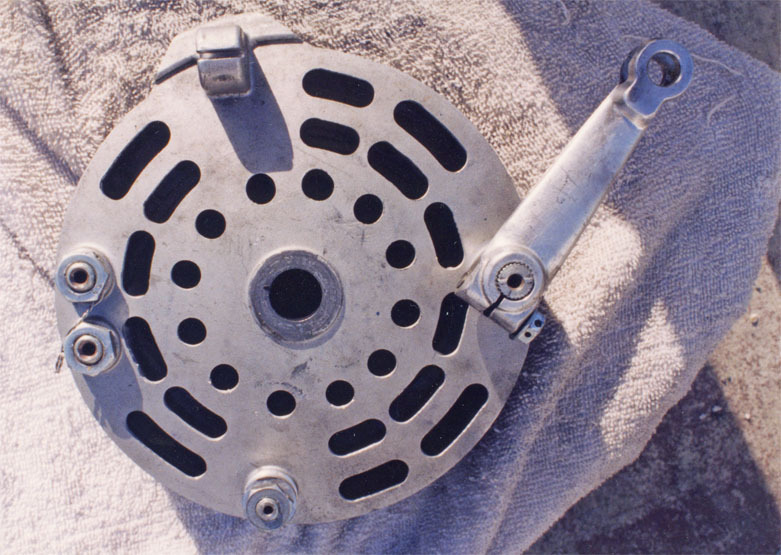 SF2RR Mk5 As above, left rear. 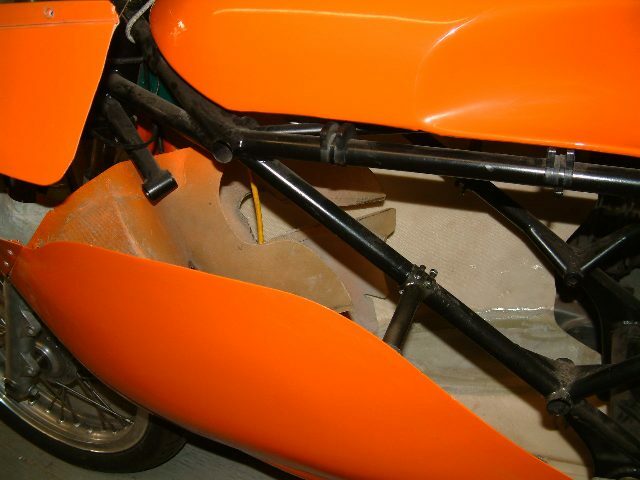 SF2RR Mk5 The swing arm pivot sheet metal has been added. 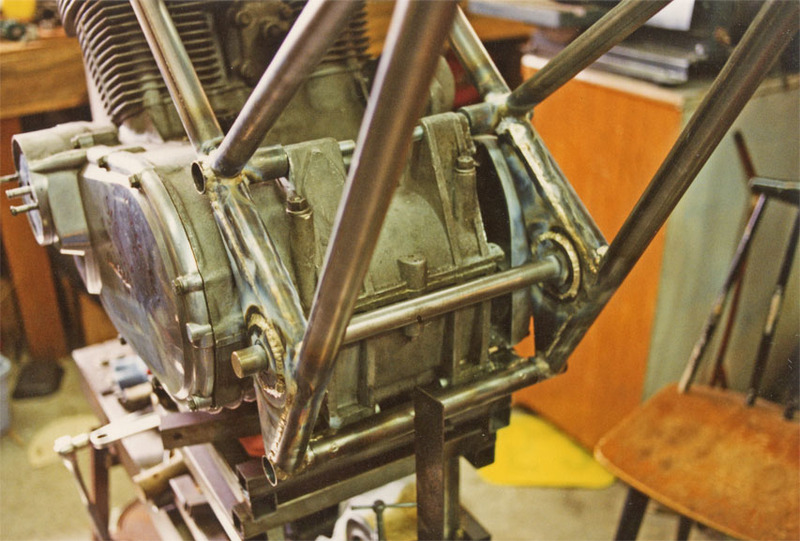 The lower cross-tube is bolted from the ends and carries the lower engine mounts. SF2RR Mk5 A slightly different angle from above. SF2RR Mk5 Parts for the swing arm. 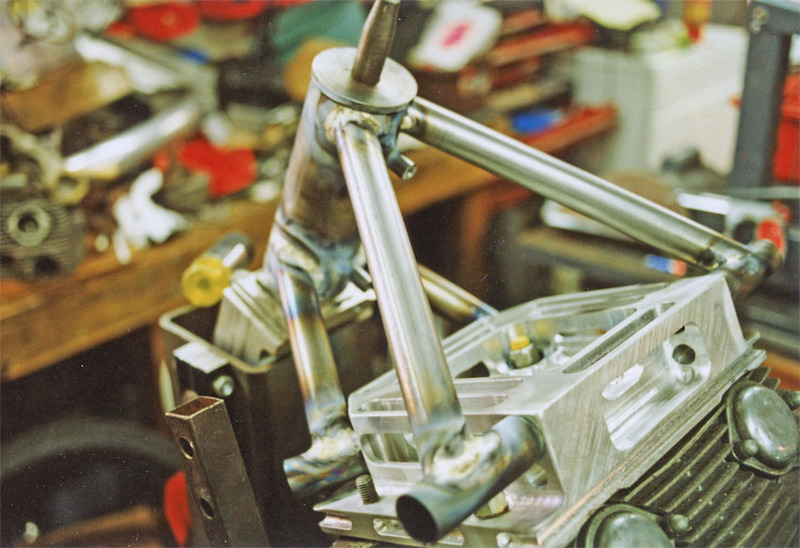 SF2RR Mk5 Swing arm construction time. 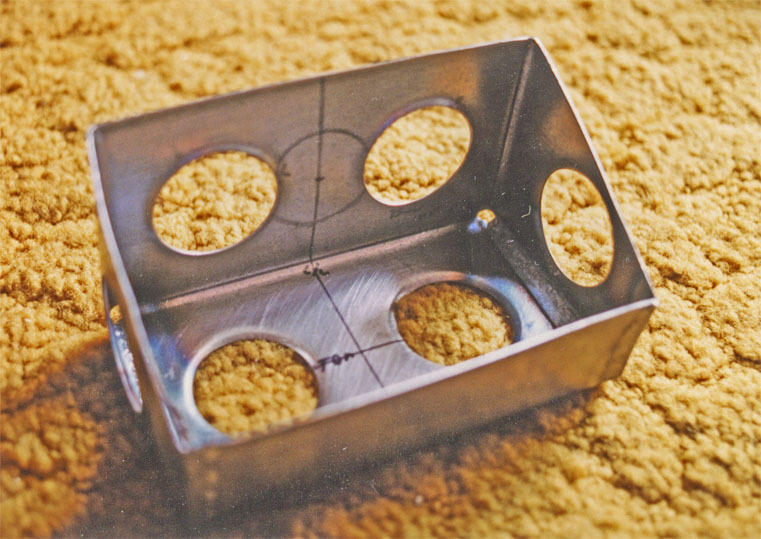 I use the back of the frame fixture base for the swing arm fixture. 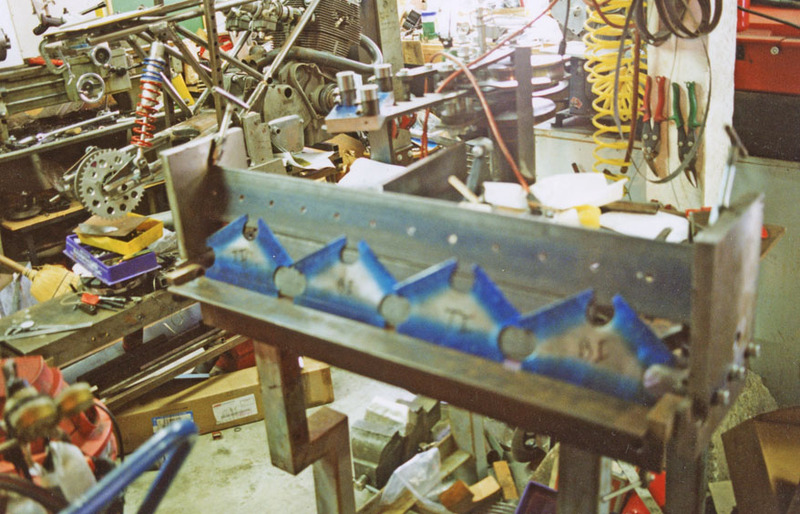 You can't have too many clamps! SF2RR Mk5 As above from a little farther away. 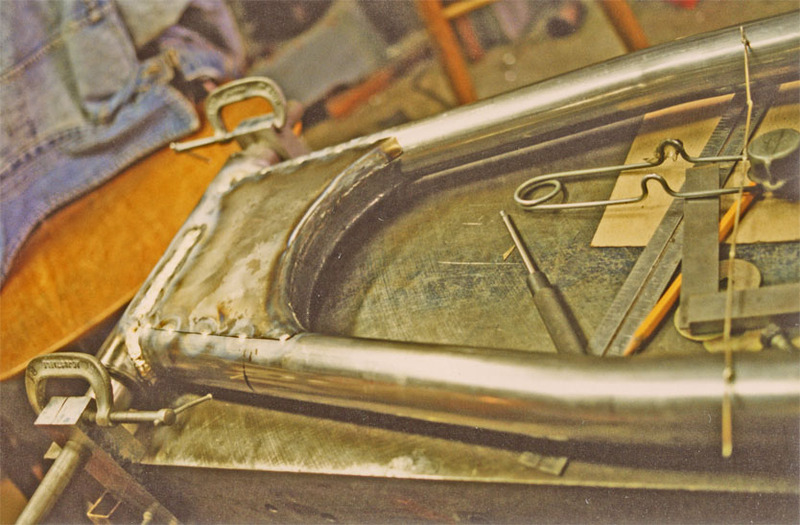 SF2RR Mk5 Adding the sheet metal "box" to the swing arm. 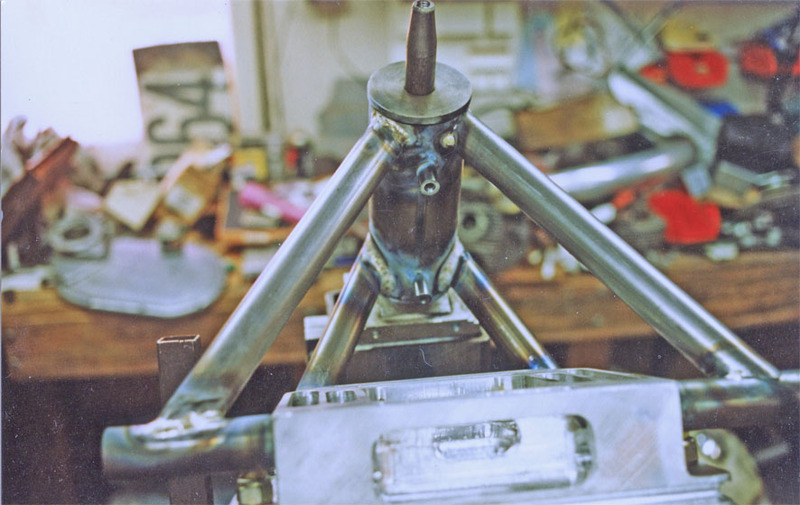 SF2RR Mk5 Left rear with the swing arm. 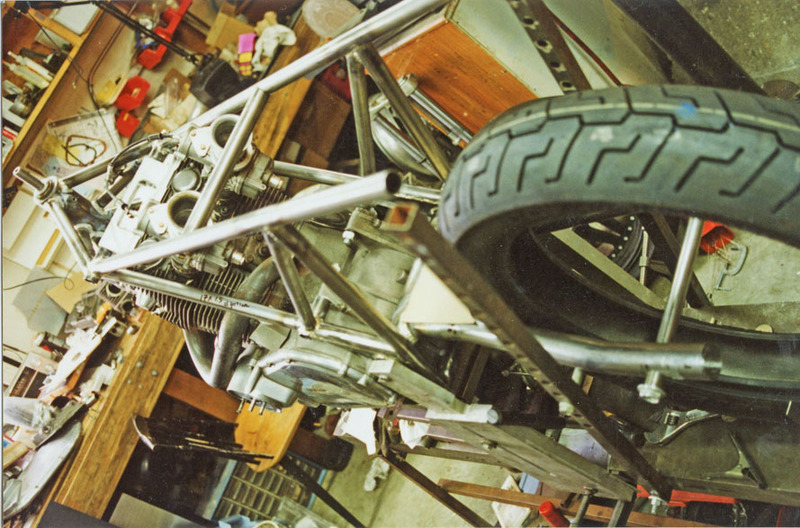 No damper mounts on either swing arm or frame. 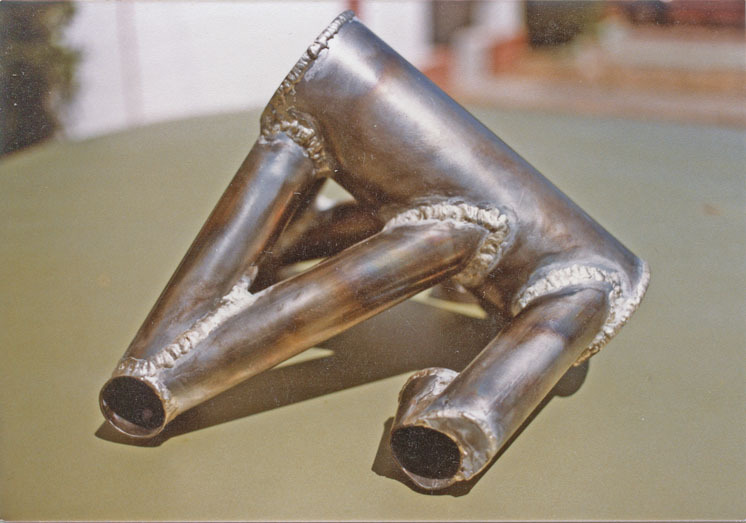 That's a CR500 Honda 20mm tubular rear axle. 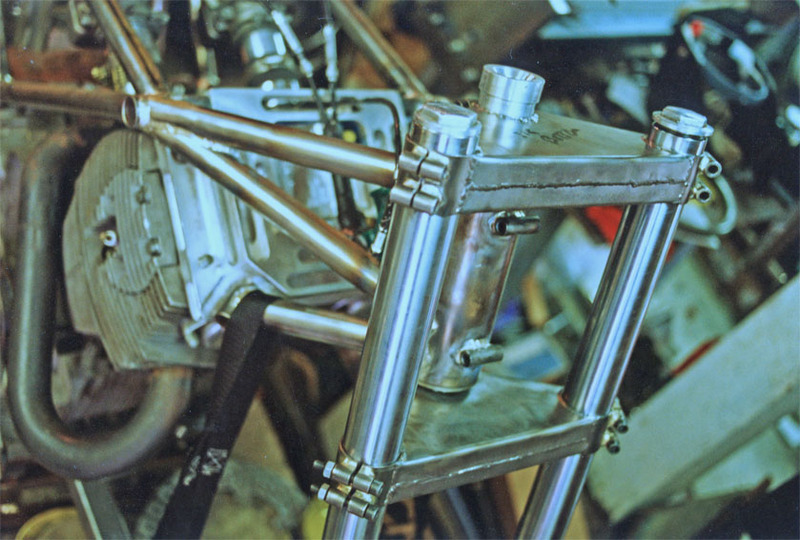 SF2RR Mk5 Right rear of the swing arm installed in the frame. SF2RR Mk5 As above but now with damper mounts installed. SF2RR Mk5 Completed frame moved to the work stand for doing wheel aligning/spacers. SF2RR Mk5 As above, from the right front. 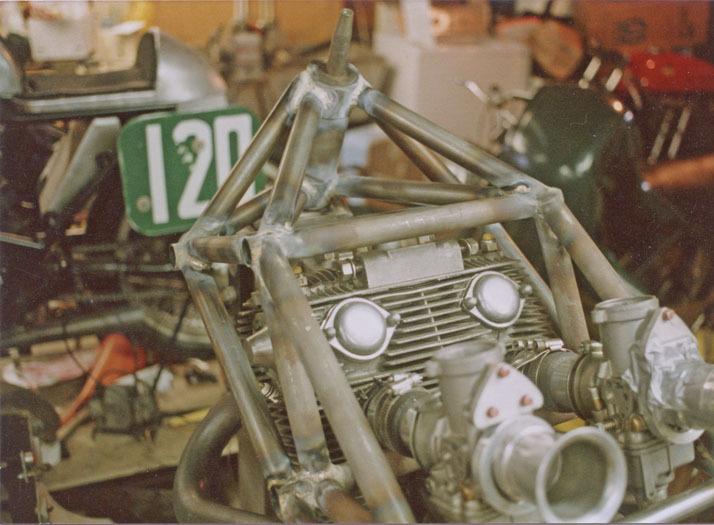 Note the JFZ stock car rotor and the 48mm Brembo caliper. 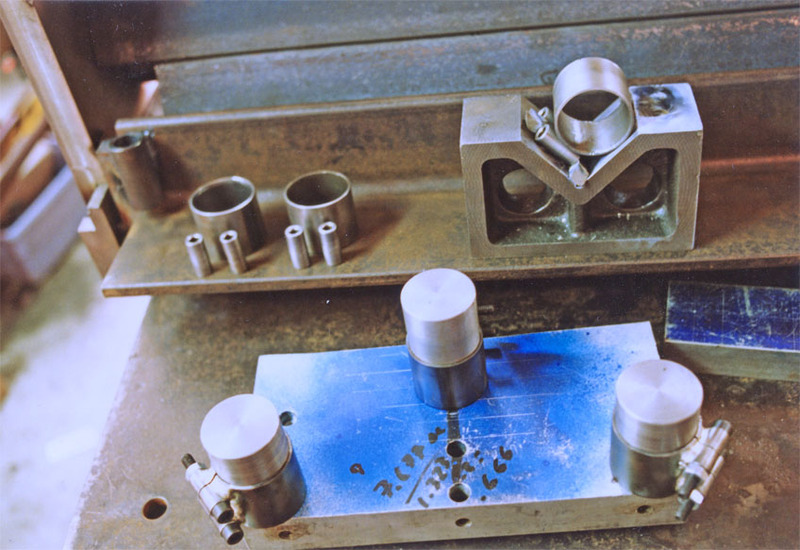 SF2RR Mk5 The fixture and some parts for the fabricated steel sheet triple clamps. 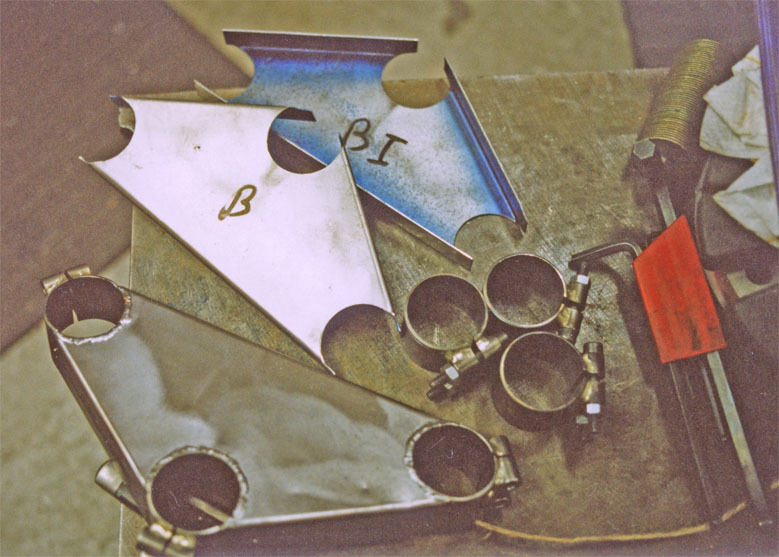 SF2RR Mk5 The sheet metal blanks for the triple clamps. 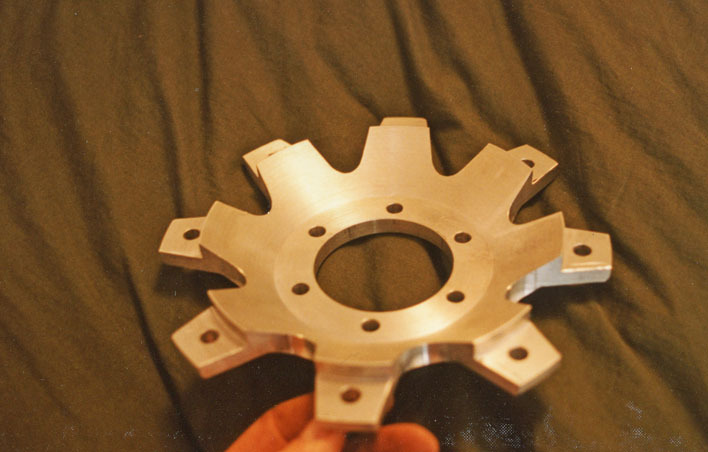 I made that metal brake and I can't claim it was of much use. 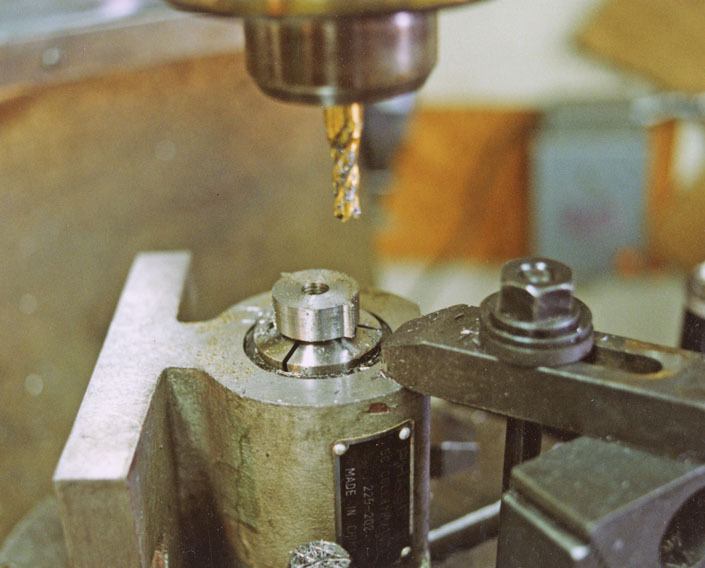 You can see the clamp fixture sitting behind the brake on the JD Squared tubing bender. SF2RR Mk5 One clamp completed, one to go. SF2RR Mk5 Completed and installed triple clamps. 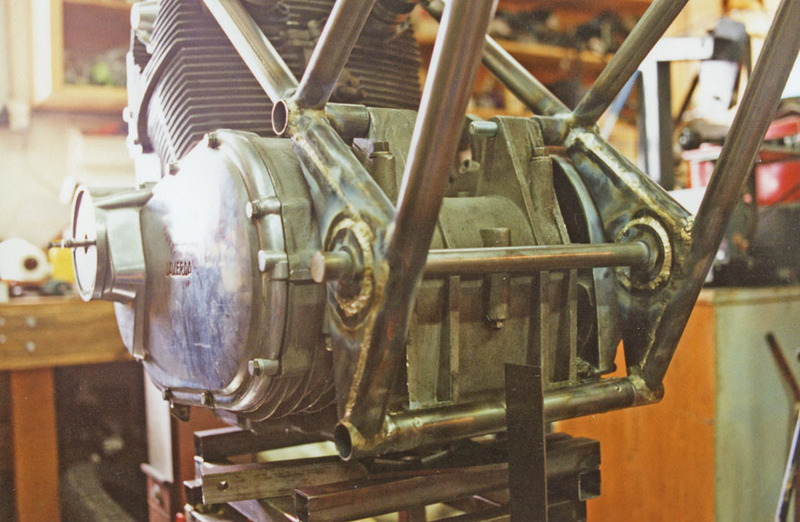 Fairing mounts have been added to the front of the steering head. SF2RR Mk5 This shows a slot milled into a fork damper rod to disable the stock compression damping so it can be controlled by a Race Tech Cartridge Emulator. 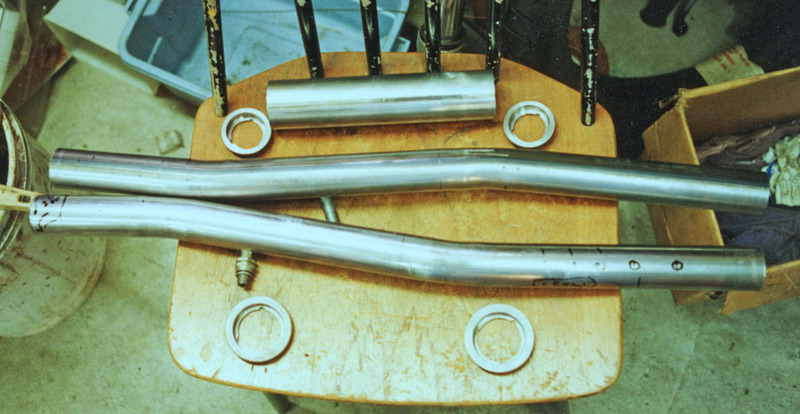 SF2RR Mk5 A fork tube top nut that has been hollowed to save weight. 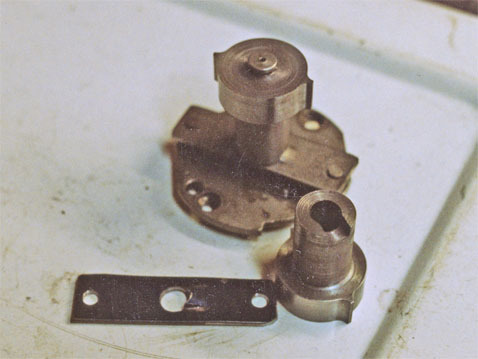 SF2RR Mk5 The modified damper rods and the adapter parts for the Cartridge Emulator. SF2RR Mk5 The battery box with flared lightening holes. 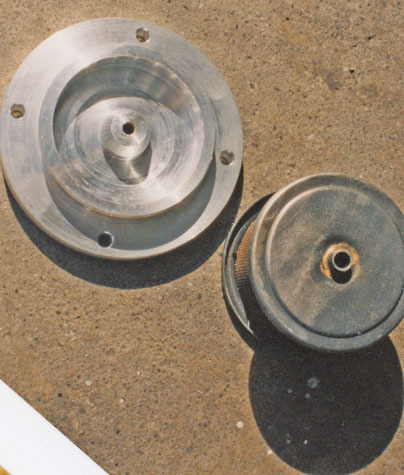 This will mount where the generator goes on a stock SF2. SF2RR Mk5 Another view of the battery box. SF2RR Mk5 A new oil filter cover that is stronger than the stock part (which can easily be broken when prying it out of the bottom of the engine). SF2RR Mk5 The filter mounted on the cover. 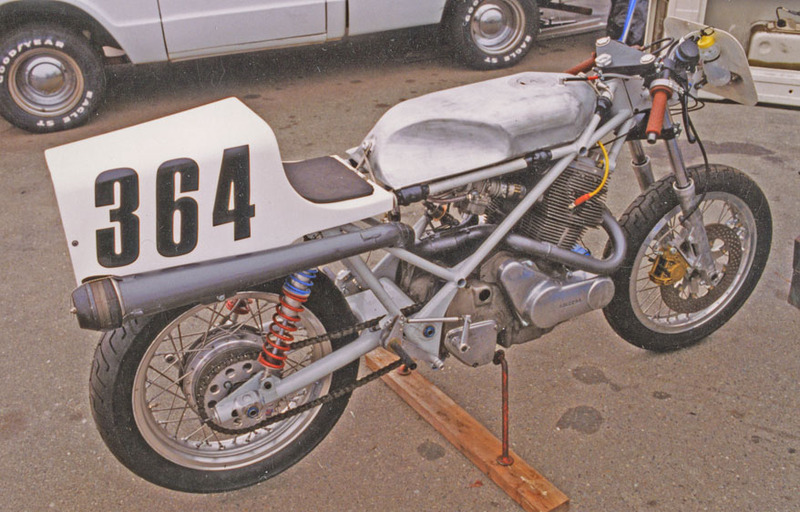 SF2RR Mk5 I used an 860 Ducati rear wheel. 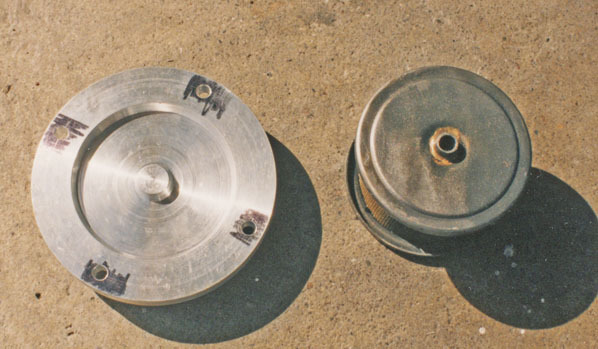 This shows the lightened brake shoes and backing plate. 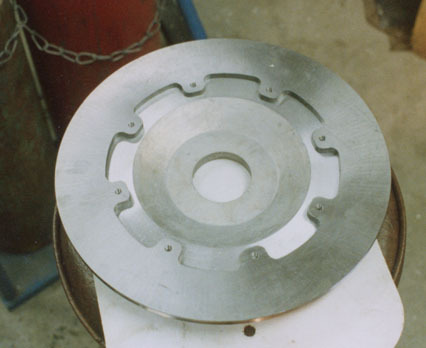 SF2RR Mk5 The other side of the backing plate. I drilled out the various shafts too. SF2RR Mk5 The JFZ disc and a partially machined carrier (not the one I used). 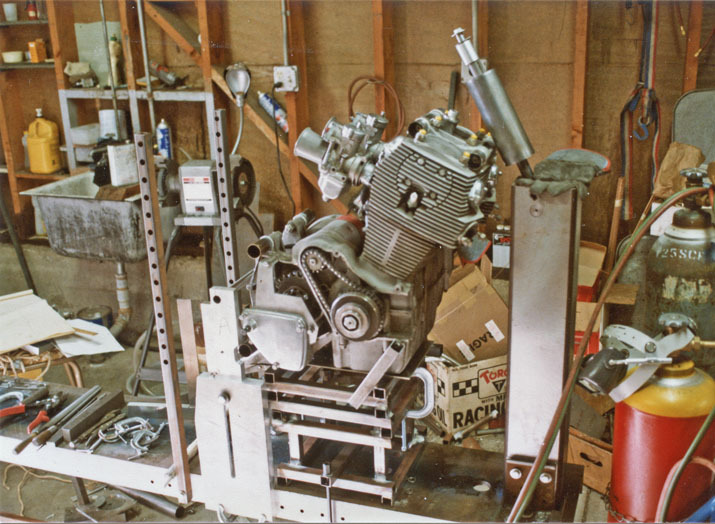 SF2RR Mk5 The crankshaft was lightened and rebalanced by Craig Hanson who also did the cylinder head work and dyno development. 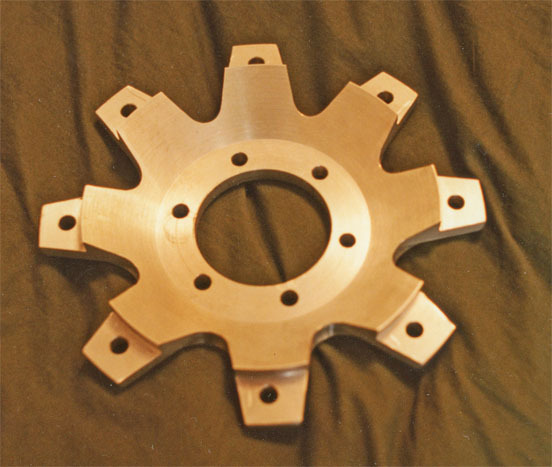 SF2RR Mk5 Drive plate and reluctor I made to adapt a standard Lucas Rita ignition to the Laverda. 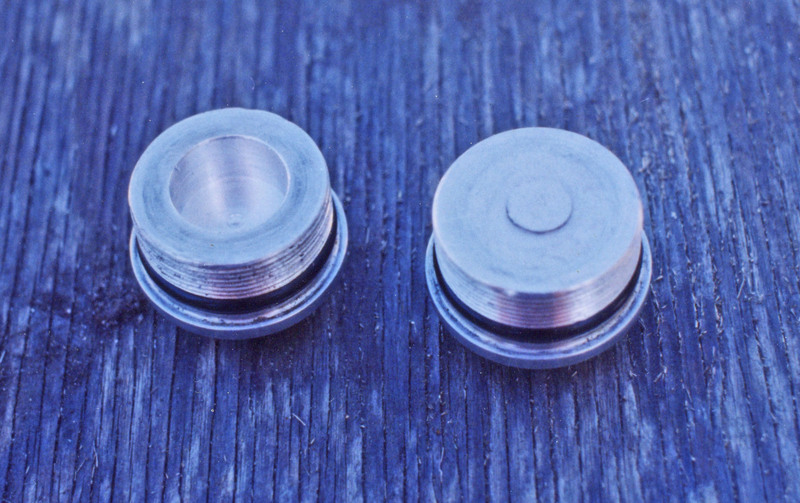 SF2RR Mk5 A reluctor having the lobes machined. 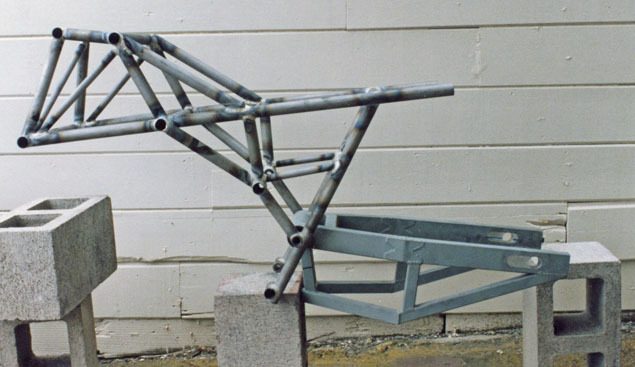 SF2RR Mk5 The assembled and painted frame with seat mounts, triangulating tubes and gussets. 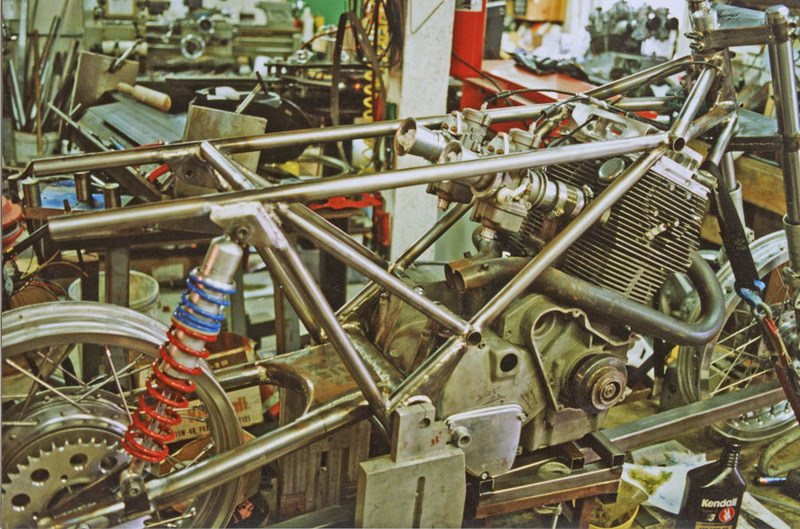 Those are Fox Superbike dampers. 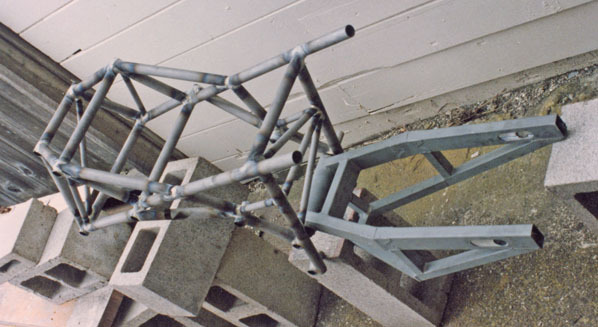 SF2RR Mk5 A different view of the assembled frame. 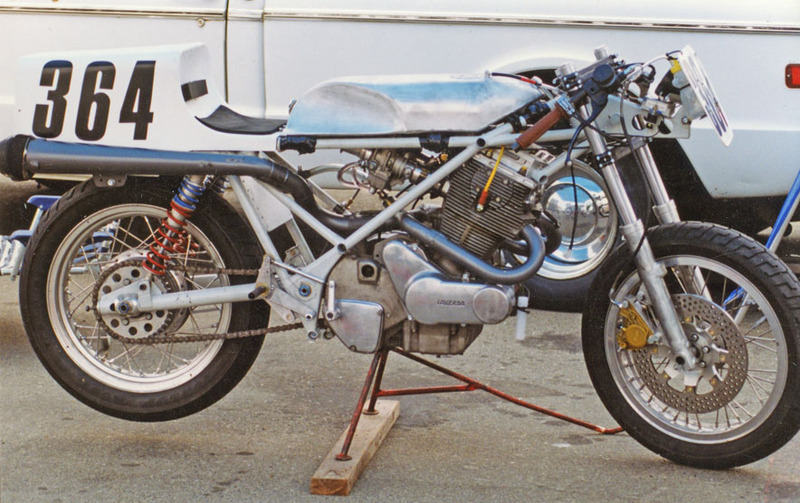 SF2RR Mk5 The completed bike at Sears Point, right side. SF2RR Mk5 As above from low in the front. 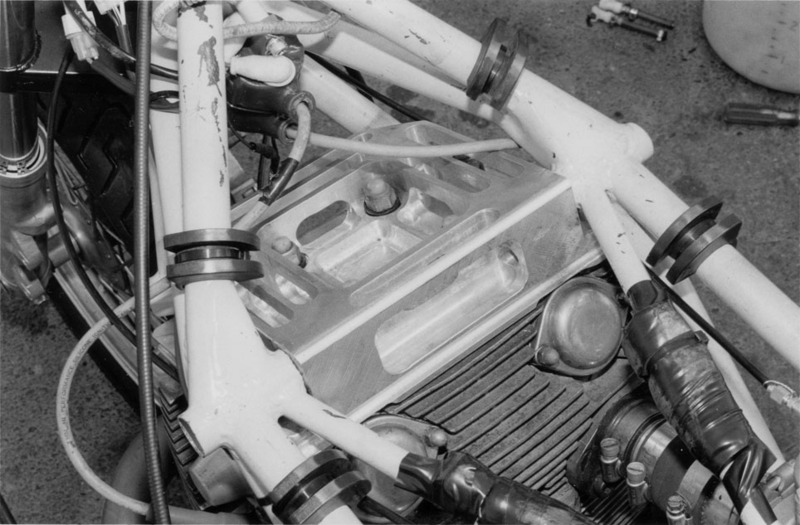 Note the battery box on the front of the engine case. SF2RR Mk5 As above, left side. SF2RR Mk5 The front wheel showing the disc and caliper carriers I made. 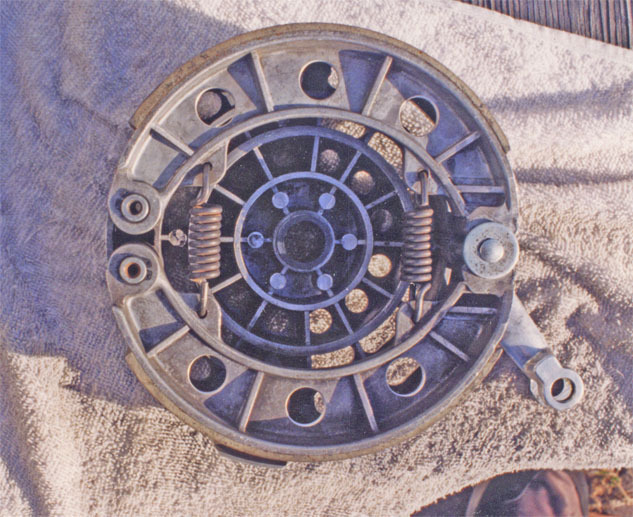 The wheel is an RD350 Yamaha part and has been modified to take a wheel bearing with a 25mm ID. 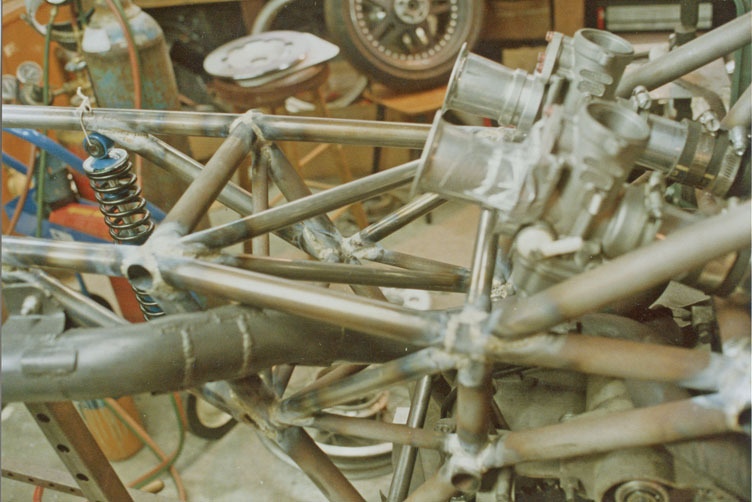 As you can see, the front axle is tubular. SF2RR Mk5 The disc carrier. SF2RR Mk5 Me and the bike. Photo by John Sweeney. 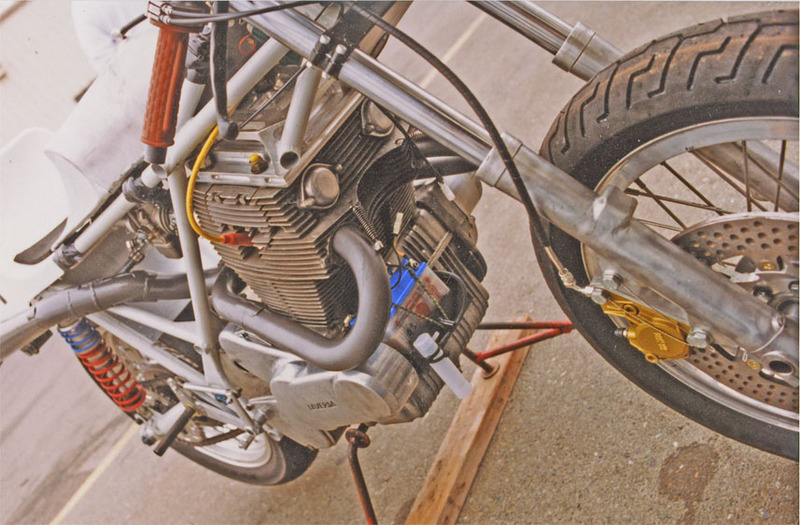 SF2RR Mk5 Left side of the bike. Photo by John Sweeney. 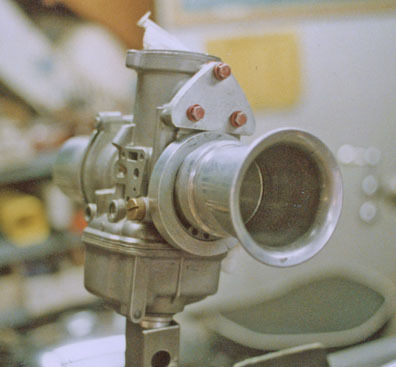 Note the custom cover replacing the tachometer drive on the left end of the cam. 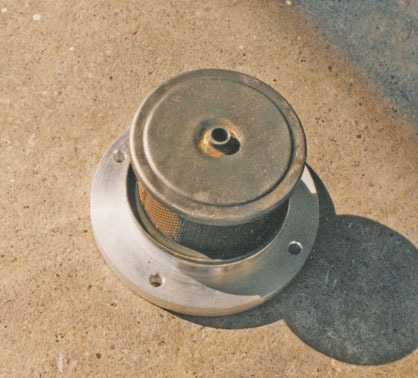 An electronic tacho was used. SF2RR Mk5 A photo by John Sweeney showing me holding the fuel tank. 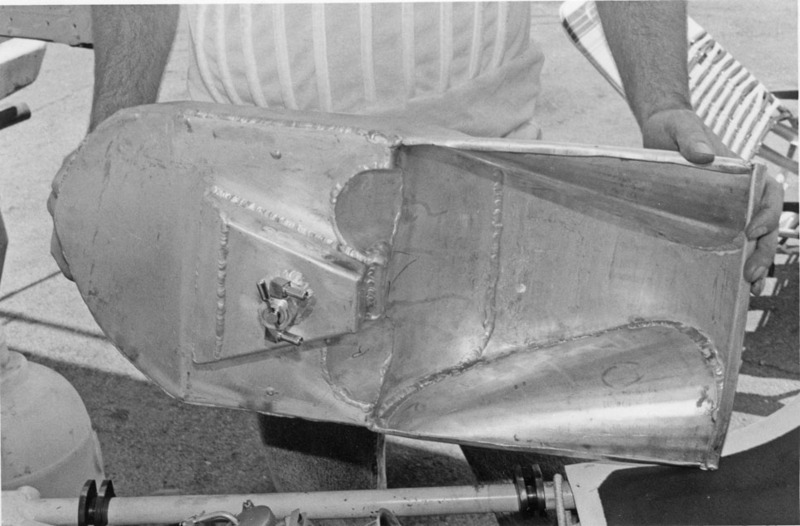 The back was left hollow as the velocity stacks fit up in that area. I eventually added a plate to allow about half the depth of that hollow to hold fuel. That is a Pingel petcock. SF2RR Mk5 The rocker cover area. Photo by John Sweeney. 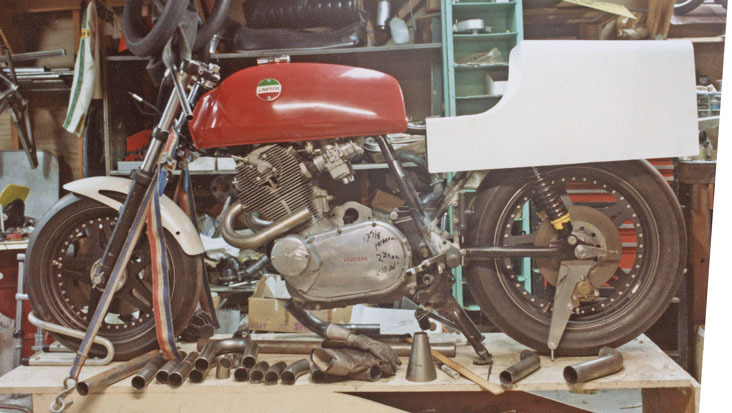 Those are Moto Guzzi tank rubbers. SF2RR Mk5 More Sears Point photos. 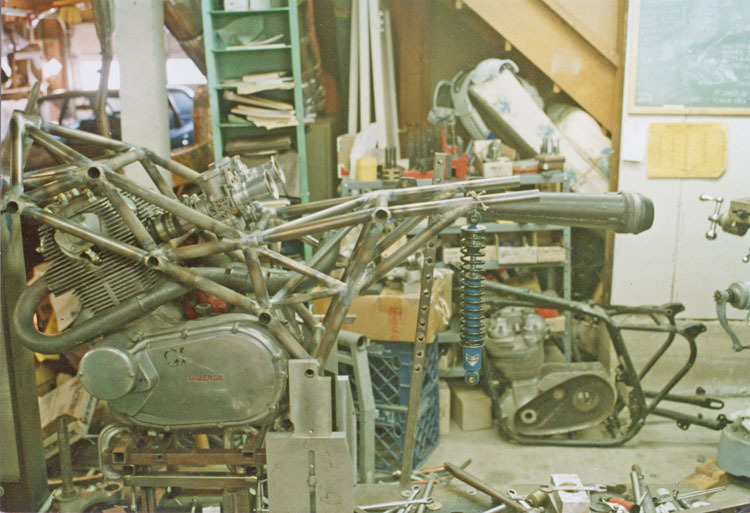 Starting the bike and talking to my friend Jim Connelly. SF2RR Mk5 In the Sears Point pits. 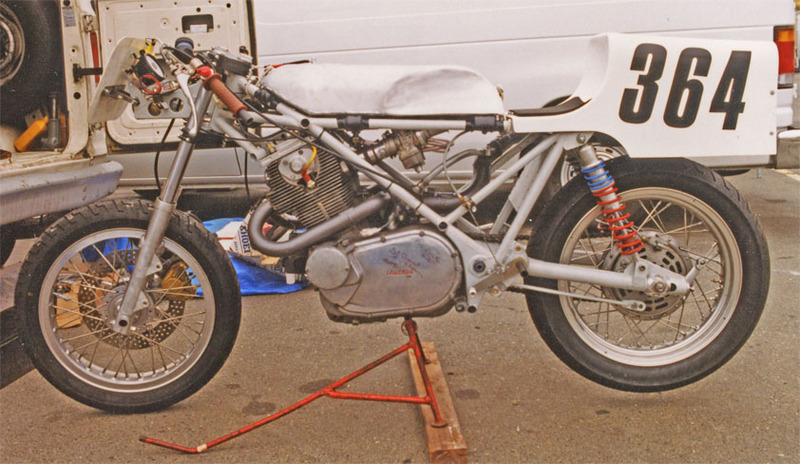 I eventually fitted an XR750 long track fairing, TZ replica front fender and a newer version of the seat and had them painted. 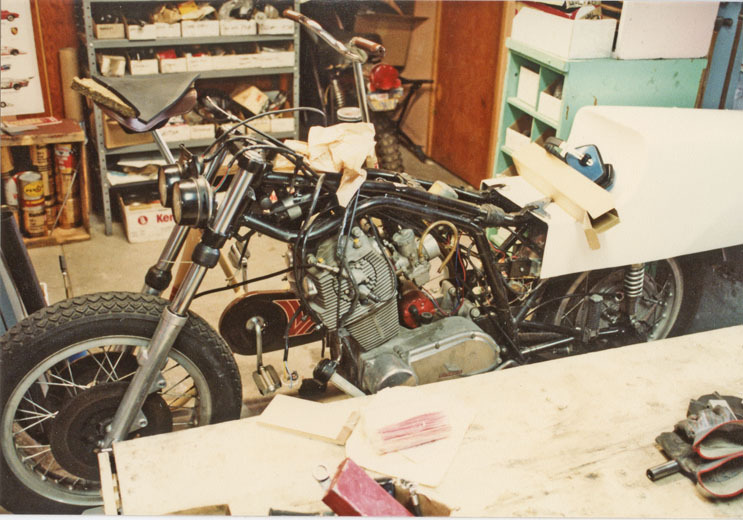 I never got the engine back together and installed before selling the racer and the SF2 street bike to another Laverda enthusiast. SF2RR Mk5 with bodywork from the left front. SF2RR Mk5 with bodywork from the left middle. 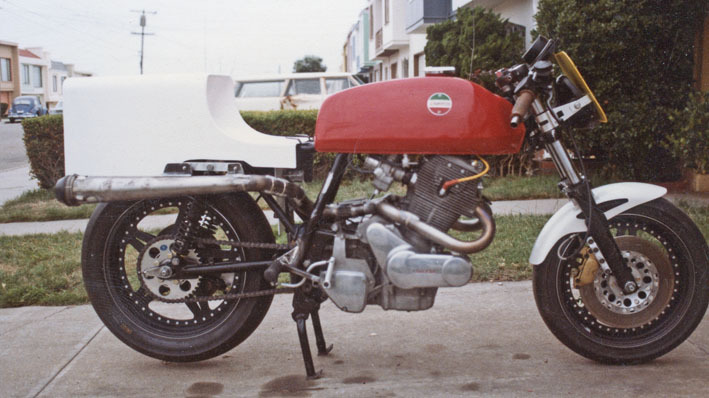 SF2RR Mk5 with bodywork from the left rear.